Actor Michael Douglas met his new co-star, the 2014 Mercedes-Benz G63 AMG 6x6 as he begins filming "The Reach." "The Reach," is about a big-time game hunter (played by Douglas) who hires a hunting guide and needs the ultra-massive Mercedes AMG to get where he’s going to find his trophy. But an accidental shooting leads to the thriller's plot. The new 2014 Mercedes 6X6 is the ideal hunting vehicle and will be a thrill to drive for Douglas. What makes the massive beast so special is it comes with a hand-built 544 horsepower AMG V8 powerplant, a 6X6 drive, an ultra-low-range, five differential locks, portal axles, tire pressure control system and a special chassis built to go anywhere on the planet. And where most other vehicles would bite the dust, this MUV (Monster Utility Vehicle) will keep on going. Douglas and his co-star MUV started filming Saturday near Farmington New Mexico. "The Reach," will also be filmed near Shiprock and surrounding areas over the next two months. The movie also stars Jeremy Irvine who is Michael Douglas character’s guide. 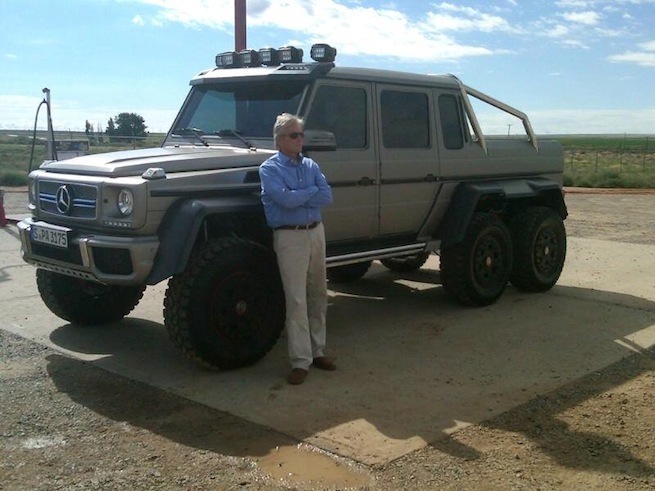 Douglas will no doubt have fun driving the new Mercedes 6X6. It will take him anywhere he wants to go on the movie set. The 2014 G63 AMG 6X6 will go anywhere a vehicle with tracks or a mountain goat would dare to venture. It features six driven wheels, an ultra-low off-road ratio in the transfer case, five differential locks which can be engaged on the move and rides on huge 37-inch tires. It's the ultimate off-road, extreme terrain vehicle. It gets the best of the G-Class series-production models refinements available. In an article in The Daily Times, the movie's publicist Allen Burry said, the exact location is being guarded place to prevent curious people from flocking to the sets. They would like to get a look at Douglas driving the new Mercedes G63 AMG 6X6. Burry said the film's actors and his massive co-star vehicle have already arrived in Farmington. Douglas arrived in Farmington and ate and watched the Thursday night football game last week at Zebra's Sports Grill, according to the restaurant's Facebook page. Michael Douglas and the 2014 Mercedes-Benz G63 AMG 6x6 will no doubt be rolling through some rough terrain in the new upcoming movie, “The Reach.” We can’t wait to see both stars doing what they do best.